Former F1 driver Esteban Gutierrez has a new ride. He’s now competing in the Verizon IndyCar Series with Dale Coyne Racing. Last week, Esteban made his series debut in Detroit. The the first race he started 19th, finished 19th. Day 2 of the race weekend went a bit better. He again started 19th, driving up to finish 14th. There’s two parts to INDYCAR, an oval side and a road side. 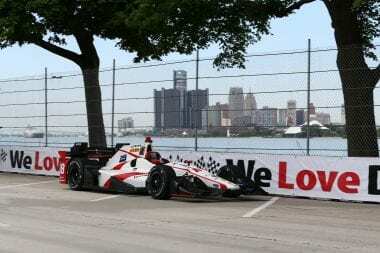 This weekend, the Verizon INDYCAR Series schedule heads to an oval. Esteban Gutierrez has a deep based road racing background. However, he’s never driven an oval, of any kind. So understandably, the Verizon INDYCAR Series hasn’t approved the driver to compete this weekend. IndyCar president of competition Jay Frye issued a brief statement to Robin Miller of Racer, “Esteban isn’t approved to run Texas because he has no oval-track experience and there’s no time to test him between now and Friday. We have an approval process for ovals and it’s as simple as that. Meanwhile, Dale Coyne Racing will be forced to choose a replacement driver. This morning, they took to twitter with a poll. They asked the fans to pick from Joe Tanto or Jimmy Bly as the driver of the #18 this weekend. If you don’t get to the movies or just lack a TV. Joe Tanto is a character from the movie Driven, which came out in 2001. Tanto was played by Sylvester Stallone. Kip Pardue played the role of Jimmy Bly.